Chris Wallace was shot 14 times. He wants others to learn from his struggle. The pain of 14 bullets hitting your body is like having a pot of hot grits dumped over your torso. Or like someone covering your body in gasoline and lighting a match. Wallace, then 27, was struck 14 times in a Wilkinsburg barbershop on Halloween in 2013. He sat in the barber chair when two men opened fire. He shot back and fell to the floor, bullets severing his esophagus and piercing his lung. What is it like getting shot 14 times? Doctors induced a coma. More than a month later, he woke up in a hospital room, hooked to tubes, with a disconnected stomach. “Everything I’d drink came out of a bag,” said Wallace, who lost more than 100 pounds in 16 months. 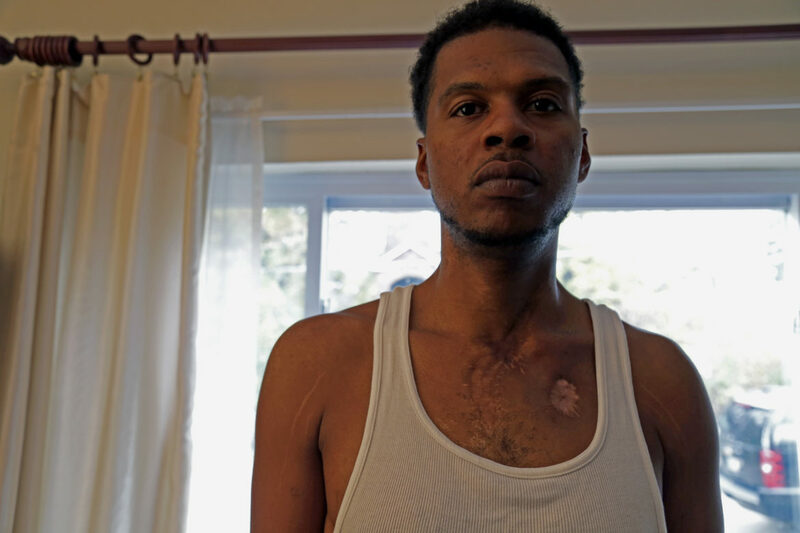 The outer wounds have healed — on the stomach, chest, side, legs, arms — but gun violence led him into a life filled with ongoing pain, surgeries, anxiety and depression. Today, he’s filled out again. He can eat on his own, and he looks like a healthy 30-year-old with dreams of working for the University of Pittsburgh violence intervention program that offered him hope when friends from the street fled. His insides are still torn, and he could face substantial federal prison time for two bank robberies last year. He describes them as desperate acts to pay healthcare costs. But with sentencing set for the end of the month, the outcome could throw his recovery on a drastically different path. Federal prosecutors do not believe Wallace has reformed. Sentencing guidelines suggest 10 to 12.5 years in prison, which they feel is appropriate based on Wallace’s violent past and inability to obey the law. “[T]he defendant has demonstrated that he will continue to commit violent crime no matter the state of his health,” prosecutors wrote in a court document filed Monday. That Wallace can still walk — let alone breathe — is something of a miracle. “Every time it was like, he was shot 14 times, how he living?” said Richard Garland, who would visit Wallace as part of Pitt’s Gunshot Reoccurring Injury Prevention Services [GRIPS]. Surviving so many shots may be rare, but young men show up at Pittsburgh’s trauma centers with multiple gunshot wounds all the time. Many of them have been there multiple times. “We’re seeing a greater rate of repeat injuries,” said Dr. Louis Alarcon, medical director of trauma surgery for the University of Pittsburgh Medical Center Presbyterian. Old wounds make surgery more difficult and can complicate the time-critical process where staff counts every bullet hole to check against the number of bullets identified in an X-ray. Every year, trauma surgeons at UPMC Presbyterian see about 500 patients for penetrating wounds from shootings and stabbings, Alarcon said. That’s roughly 10 every week. Doctors are just trying to save a patient's life when they arrive at the hospital. Some patients may require additional surgeries in the following weeks. It’s during that period when victims might get a visit from Garland, a longtime anti-violence advocate who is focusing on interventions in the hospital to keep young men from being involved in future violence. Growing up in Lincoln-Lemington, he said he got involved in what he calls “the streets” around 12 with a neighborhood clique. He and a friend jumped a kid, he got into fights, and he was in and out of Shuman Juvenile Detention Center. He said he looked for negative attention to fill what he felt he was missing at home. His father died when he was young so his mom was raising three boys on her own. Wallace became a father himself just as he turned 16 and was spending more time on the streets. Fistfights led to guns, and juvenile trouble to adult charges. A bullet in the leg in 2005 barely slowed him down. He counts 37 people he knew from his neighborhood who were killed in gun violence, including a dozen close friends. “A lot of my friends went out with one shot to the stomach,” Wallace said. In Wilkinsburg, 14 shots stemming from a dispute over drug money changed his life in ways he couldn’t ignore. Police arrested a suspect, initially identified by Wallace, but he later denied that the man was involved, and the case was dismissed. At first, Wallace was brooding, wanting revenge, even though he was being fed through a tube. Garland came around, and he got a familiar brush off. After a second visit, Garland gained his trust. Friends from the streets started to turn away, but Garland offered support. He not only helped him rethink his life but also offered more basic help. That’s the key to interrupting violence. Success depends on offering a path away from the streets and connecting patients to social services as they try to put their lives back together. 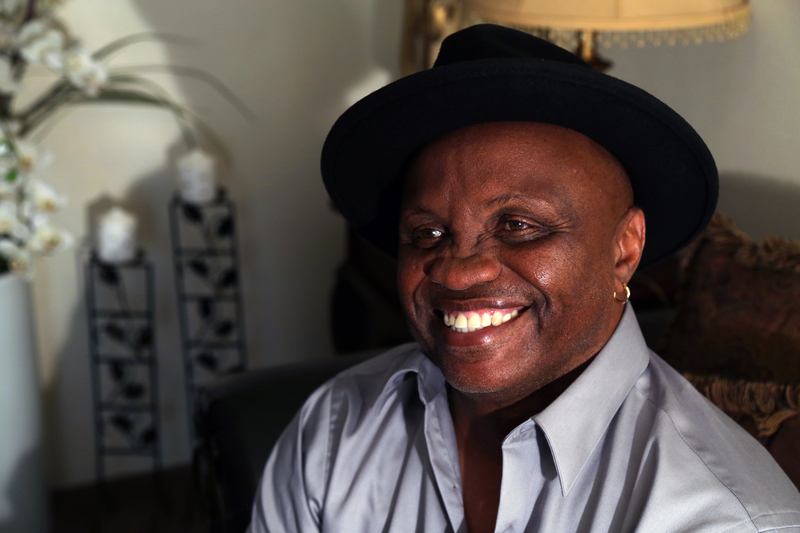 Garland, who came up in the 1970s in Philadelphia, spent two decades incarcerated on gang-related charges, before turning his life toward anti-violence work in Pittsburgh. He understands the pull of the streets, even the fun of it, and he knows what happens to young men when they don’t get out. Young men heal, or think they do, and even if they’ve been connected to work or social services, they often fall back in a life tied to guns and drugs. “We set up all this stuff and then we get no follow up,” said Leigh Frederick, an injury prevention specialist at UPMC Presbyterian. "There’s a whole lot of dudes that say ‘yah yah yah yah.’ But soon as they start feeling good, they like, ‘I’m back in the streets.'" With hundreds of young men injured or killed in gun violence around Pittsburgh every year, the need for outreach is obvious. Garland is one of only two GRIPS workers visiting victims. UPMC also has a staff of social workers, but Frederick said the size of the violence problem far outpaces the number of people working to stop it. Garland was pushing for Wallace to get hired at Pitt to do that type of outreach work. But then Wallace robbed two banks. In February 2015, after having Medicaid suspended and struggling to afford feeding tubes, Wallace entered a First Commonwealth Bank in Lawrenceville and PNC Bank in Penn Hills and demanded cash after claiming he had a bomb. By that time, he says he had dropped to 77 pounds, scant for a man who stands at 6 feet 4 inches. He looked emaciated and malnourished. He was arrested at the hospital, taken briefly to Allegheny County Jail and then to UPMC Mercy where he was given feeding tubes. He was returned to jail days later, where an October lawsuit alleges that staff failed to properly feed him, badly threatening his health. He was hospitalized again, then taken back to jail before he was once again hospitalized after passing out in the jail infirmary, suffering a heart attack and a number of ailments including kidney failure and malnutrition, the suit said. Garland feels like Pitt failed Wallace by moving too slowly with the hiring process. His injuries made finding jobs involving manual labor impossible, but he had a powerful story for gunshot victims. Now, Wallace is resigned to substantial prison time but is hopeful the court sees the robberies as acts of desperation. In either outcome, he wants to pursue work as an anti-violence advocate, following the example set by Garland, who’s the type of mentor that can shift their discussion from blunt truths to shared admiration for Keanu Reeves as an action star. What do you want for your future? Wallace is still healing. He needs surgery every three months to get his throat stretched. He has to sleep at a 45 degree angle, and needs doctors if food gets stuck in his throat, or if his heart is beating abnormally. That’s the consequence of 14 gunshots, which left him scarred up his torso, unable to wrestle with his children without fear of internal injuries. And it’s a life that Wallace wants to convince others isn’t worth the pain. Finding that perspective sooner might have saved lives. Wallace lived through it and wants to move on. Reach Jeffrey Benzing at jeff@publicsource.org or (412) 515-0062. Follow him on Twitter @jabenzing.